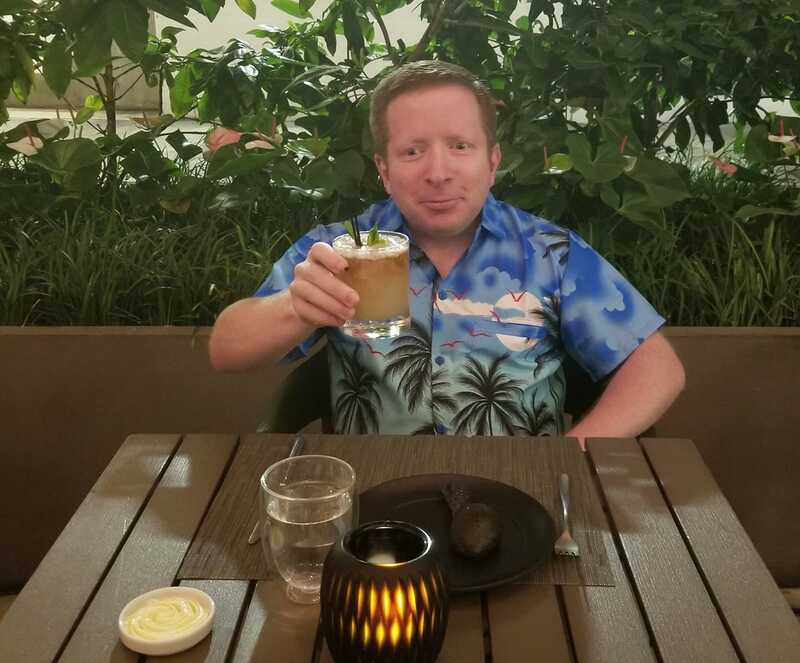 Me enjoying a Mai Tai at a restaurant in the Waikīkī section of Honolulu. Since 1959, the U.S. has consisted of 50 states; in that year, Alaska and Hawai’i became the most recent jurisdictions to gain statehood. Just visiting all 50 of the states in the sprawling nation that I call home is a mammoth undertaking. In the final hours of 2018, I completed my project of karaokeing in all 50 of those states (as well as the national capital city of Washington, DC, which does not itself belong to any state). For a more detailed background on the quest that I was pursuing, see my prior posts recounting my karaoke appearances throughout the U.S. in 2016, 2017, and the earlier part of 2018. Between July 2016 and July 2018, the number of states in which I’d karaoked increased from 20 to 49. That left only one state to check off: the archipelago of Hawai’i. I felt it was fitting that the 50th state to join the U.S. would become the 50th state on my American Karaoke Tour. 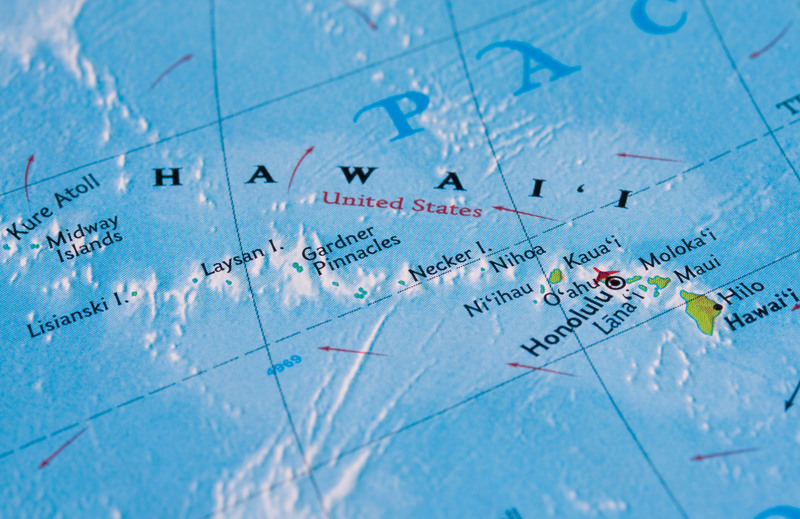 Geographically, Hawai’i differs greatly from any other state in the U.S. Consisting principally of 8 main islands (7 of which are inhabited), its territory also includes numerous additional islands, islets, atolls, and reefs. Did you know that Hawai’i is actually composed of 137 total islands of various sizes? Those islands, stretching from Hawai’i (often called the “Big Island”) in the southeast to the Kure Atoll in the northwest, extend for roughly 1,500 miles. But you only ever hear about the octet of main islands — such as Oahu, home to the state’s capital city of Honolulu. That capital city lies over 2,500 miles southwest of Los Angeles. The Hawaiian state is located in the Tropics, the zone between the Tropic of Cancer and the Tropic of Capricorn. In fact, the main Hawaiian island chain forms one of the corners of the Polynesian triangle. (That triangle’s other vertices are Easter Island and New Zealand.) Such an exotic setting seemed the perfect locale for the culmination of my American Karaoke Tour. This image shows the complete Hawaiian archipelago. Follow my World Karaoke Tour! I am currently . . . This is what Notre-Dame Cathedral looked like during my September, 2004 visit to Paris. I'm absolutely heartbroken by today's fire. Today I attended the cherry blossom festival on Roosevelt Island, a tiny island in the East River between Manhattan and Queens. What are some of your favourite things to do when it finally starts to feel like spring? NYC's Central Park opened in 1858, but did you know that it contains a much older artifact of ancient Egypt? Cleopatra's Needle, a roughly 3,500-year-old Egyptian obelisk, has stood in the park since 1881. It's adjacent to the Metropolitan Museum of Art. The transfer between the Broadway-Lafayette and Bleecker Street subway stations in NYC features an art installation called "Hive (Bleecker Street)," consisting of honeycomb-shaped LED light panels on the ceiling that constantly change colours. Created by the artist Leo Villareal, it was unveiled in September 2012 and is still there! Who's been logging on to this site? The writing and photographs on this blog are copyrighted intellectual property, all rights reserved, and may not be reproduced without permission.